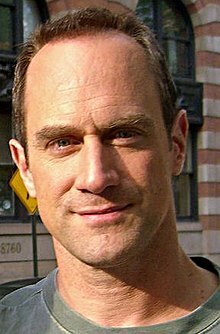 Christopher Peter Meloni or Chris Meloni (born April 2, 1961) is an American movie, voice, and television actor. He is best known for his television roles as NYPD Detective Elliot Stabler in Law & Order: Special Victims Unit and as Chris Keller in Oz. Meloni also appeared as Colonel Hardy in the 2013 movie Man of Steel. Meloni was born on April 2, 1961 in Washington, D.C.. He is of Canadian-French descent. Since 1995, he has been married to Doris Sherman Williams. They have two children. Meloni is a long-time gay rights supporter.